PTJ is right… Those of you familiar with our debt-cycle framework know that the Fed drives the business cycle by raising or lowering the cost of money (interest rates). 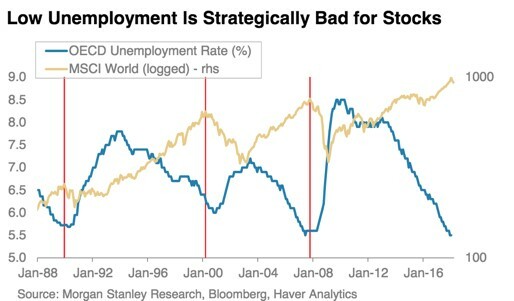 And the Fed bases its rate decisions off of its two mandates (1) maintaining full employment and (2) and stable prices (ie, 2% inflation target). These two mandates are intimately connected. A tight labor market drives wage pressures as businesses are forced to pay up for scarce labor. These increased costs eventually get passed to the consumer in the form of higher priced goods and services (ie, inflation). Higher inflation leads to more aggressive rate hiking by the Fed which tightens liquidity, squeezes risk-premiums, and turns the debt cycle over into a short-term deleveraging. We are now in this “late-cycle” phase of the short-term debt cycle. We call this period the ‘Overheat Phase’ as per our Investment Clock framework. This phase of the cycle is distinctly different from the previous one and thus needs to be traded and managed differently. 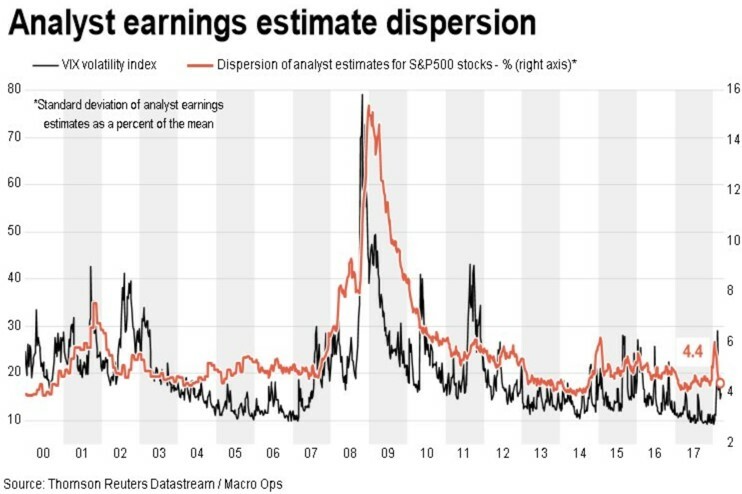 Where low volatility defined the prior period, this one will be marked by high volatility and greater dispersion between asset returns (ie, a wider gap between winners and losers). Let’s run through the evidence real quick. Then we’ll talk about a unique approach we use in this type of market regime that allows up to better manage risk while still keeping our portfolio open to plenty of upside. 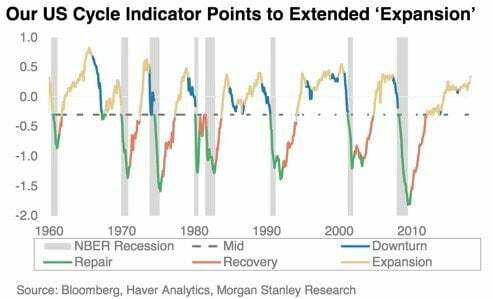 To start, every important macro indicator we track tells us that we’re in the late phase of the bull cycle. This phase typically lasts between 18 and 30 months and we entered this period last year. We’re closer to the middle of this phase than the end of it which is supportive of a continuing bull market. 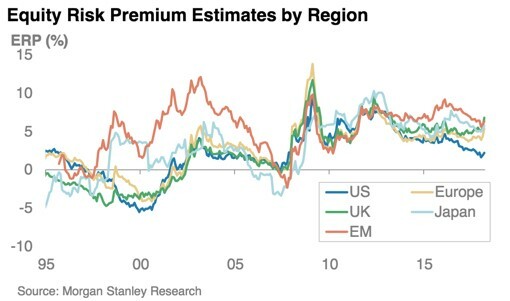 Equity risk-premiums (the difference in earnings yield on stocks relative to government bonds) has tightened significantly but there’s some risk-premium left. The spread is still above the levels reached in 07’ and 00’. This is supportive of stocks over the near-term. The GDP Gap has closed and the economy is now operating at above capacity. This means that demand is beginning to outpace the economy’s ability to service it which is leading to demand-pull inflation, which we can see in the chart on the left. 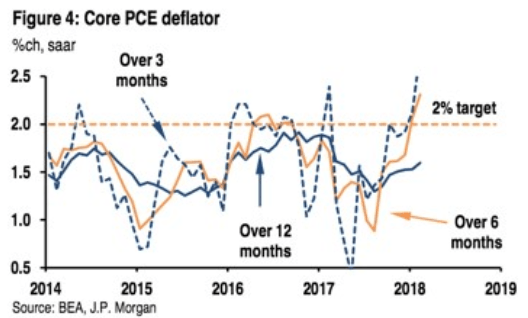 This is why we recently saw the largest 3 and 6 month annualized jump in Core PCE inflation readings in over a few years. The jump in inflation has spurred a rise in inflation expectations (a circular feedback loop is at risk of forming) which has caused interest rates to spike over the last few months. Bond yields affect stock prices in two ways (1) they compete with equities for investor capital flows, a higher yield makes them more attractive on a relative basis and (2) higher yields (interest rates) raise the discount rate at which stocks are valued, which lowers the the present value of their cash flows. This relationship is easily visible in the chart below. Rising bond yields leads to a dislocation in the equity market and falling yields are supportive of risk assets. Note how the latest market sell-off that began in January was caused, not by concerns over trade wars or tech regulations, but by rising yields. 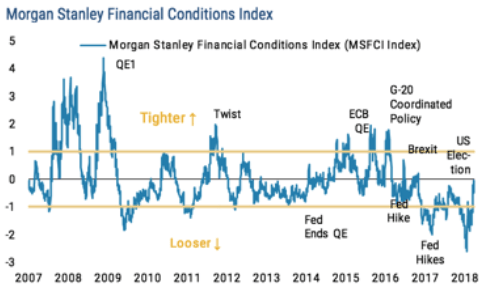 Higher interest rates are causing liquidity to shrink (ie, financial conditions to tighten) albeit from very loose levels. So here we are…. In the middle part of the late-cycle phase of the short-term debt cycle. 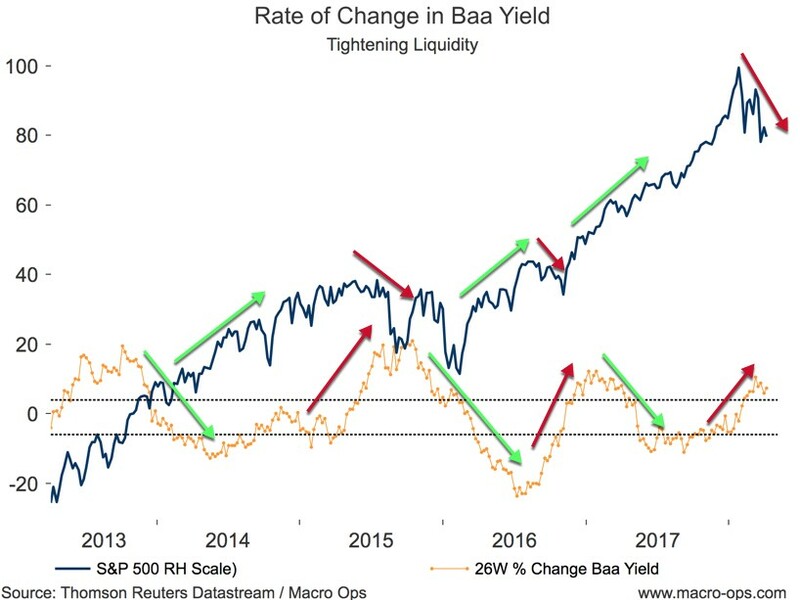 Inflationary pressures are building, thus driving interest rates higher which is leading to tightening liquidity and higher volatility. What is a trader/investor to do in this type of environment? Thus, in increasingly volatile environments like the one we now find ourselves in. Our team at MO utilizes a method of trade construction that we picked up from hedge fund manager, Jim Leitner. We call this our DOTM strategy which stands for Deep Out of The Money options. We exploit a key inefficiency in the failure of long-term out of the money options to correctly price in drift (or trend). This allows us to only risk small amounts of capital while still being able to create huge convex payouts — on the order of 20x+. And just as importantly, it allows us to outsource trade management to the option — which cuts out our risk of getting whipsawed in a choppy market. This Saturday, April 14th at 2 PM EST we’re hosting a live webinar event that will show you exactly how we implement our DOTM approach. We’ll be covering everything from the theory behind it to the exact rules we use to select the perfect DOTM option. Click here to register for the DOTM special event! We only do public events like these once a quarter and we don’t record them so be sure to register. You don’t want to miss how we use this vital tool to maximize risk-adjusted returns in a late stage bull market.